Has your child ever told you they “can’t do it” or they are just “no good at” something? As a parent, it is sad to hear your child express this about themselves. It can be especially difficult when you know your child is capable, but it is just going to take time and practice for them to master the concept. So how do you approach this? How do you support your child when faced with these problems? The first step is to acknowledge how your child is feeling. Often, we want to “fix” the situation and tell our children that everything is ok and that they are not bad at something. While our intentions are good, what this really does is send a message to our children that they are wrong about how they feel. Instead, simply repeating back, “I hear that _____ is really frustrating you” can have a great impact. This shows your child that you understand how they are feeling. Once you have acknowledged the way your child is feeling, the next step is to help your child see that this is simply a step on the way to their goal. For example, if your child is learning to ride a bike, you can say, “You don’t know how to ride a bike, yet.” This shows that you see they don’t feel confident in the area but that you have faith that they will master it at some point. In our class, we have a special “class pet” that helps us to remember the power of “yet”. On our wall hangs a drawing of a “yet-i”. His image helps remind us of the tremendous power of such a small word. 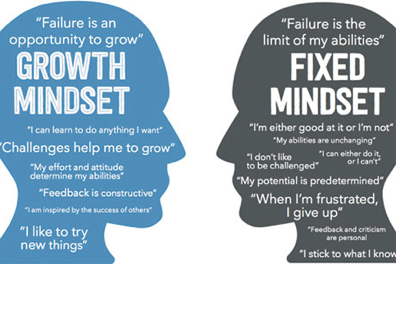 The differences between the growth and the fixed mindset. Written by Kristin Tosello, Head Guide in the Junior Classroom. She has been teaching at SCM since 2010 and attended the school as a child. Kristin works in our upper elementary program with 4th, 5th, and 6th year students.